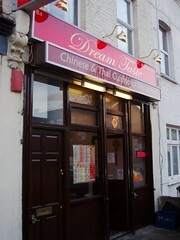 Dream Taste was a pretty decent Chinese takeaway in Nunhead. It closed some time in 2010. Pretty decent Chinese takeaway in Nunhead. (Much of the interweb seems to think it's in East Dulwich, though.) You can order online from Just-Eat or from Hungry House. Note however that card surcharges as well as delivery charges and areas seem to vary depending on which of these you order through, so check both sites for the best deal. Kake, doop, and bob have ordered from here several times since we discovered it in early 2008. Even though we don't live particularly close, the food always arrives promptly and is well-packaged, fresh, and hot. Grilled Peking dumplings (£3.60 for six, ordered by Kake many times but most recently in July 2009) aren't bad at all; good, thick, chewy skins, well cooked, and nothing wrong with the filling either. Crispy duck with pancakes (£6.90 for a quarter duck), sampled in February 2008, was pretty good; it correctly came as a whole piece that you shred yourself). Hot and sour soup (£2.20, also in February 2008) was good apart from the tough pieces of chilli skin floating in it. "West Lake beef soup", sampled in July 2008, was good, with a mild flavour, large swooshes of egg, and peas well-judged enough to please even Kake, who is very fussy about old, overcooked peas. They also do a "dim sum platter" of cha siu bao, har gao, and siu mai photo 1, photo 2, which Kake orders fairly often. The har gao are made in a press rather than properly pleated, and the wrappers aren't really up to scratch — but it would be quite a lot to expect proper har gao from a little local takeaway like this, and they certainly satisfy the dim sum craving. The siu mai are fine too. Note that the pricing and portioning of the dim sum platter varies depending on whether you order from Hungry House or Just Eat; with Hungry House you can order a "two-person portion" for £7, which includes three har gao, three siu mai, and two cha siu bao, whereas with Just Eat the minimum order is twice as expensive (£7 "per person", minimum for two people) and twice as big. Among the mains, pan fried salmon in soya bean sauce (£4.90, tried in February 2008) was good; the salmon was encased in a thin batter to preserve its tenderness. Beancurd with green peppers in black bean sauce (£3.50, also February 2008) had a generous proportion of beancurd, and the beancurd was cooked well too, not over-fried like it is in some places. Vegetarian ma po tofu (£3.50, April 2008) wasn't bad, but like the hot and sour soup had a slight tendency towards overly-tough chilli skins. A favourite of both Kake and Ewan is the aubergine with peppercorns and spiced salt (£3.50), a dry dish along the lines of salt-and-pepper tofu. It's well-flavoured and not too greasy. Ewan considers it to really be of a higher order and very good indeed, a lovely combination of a dry batter with the aubergine which I would highly recommend for every future order from here (and indeed I have had it several times since). Kake was a little worried by the mains in our July 2009 order; both beancurd with ginger and spring onions (£3.50) and king prawns with green pepper and black bean sauce (£4.20) had an overly-high proportion of onion — hopefully this is just a blip, and not a sign of ongoing cost-cutting. Egg fried rice (£2.20) is generally competent if nothing special. House special fried rice (£4.50) had a slightly unusual presentation; it was basically a box of egg fried rice with all the other bits and pieces laid neatly on top. As well as the Chinese dishes, they also do some Thai food, which (according to doop) is a very Chineseified kind of Thai food, but tasty enough if you like that kind of thing. Thai special chow mein, sampled by Kake in July 2008, had a decent level of chilli heat and some very well-judged seafood, including non-rubbery squid and king prawns just on the edge of being undercooked (a good thing, in my opinion). secretlondon has also tried this dish photo and noted that it had quite a lot of seafood. Ewan has ordered the Thai green curry with vegetables twice, and considers it an acceptable though not particularly amazing Thai dish; the Chinese dishes are definitely superior. Kake's/bob's/doop's verdict: This is definitely one of our favourites among the takeaways that will deliver to SE16. Food last sampled by Kake and doop, 9 July 2009. Last edited 2019-03-19 13:46:19 (version 31; diff). List all versions. Page last edited 2019-03-19 13:46:19 (version 31).